As Marguerite most kindly proposed me to write an article for her blog, here are a few lines on the French counterpart of the “We” and “Together” campaigns, which were discussed respectively here and here. The “Défi pour la Terre“, or “Earth Challenge”, was launched in May 2005 by the famous French journalist, TV personality and environmentalist Nicolas Hulot. With his show Ushuaïa, he has been presenting the marvels of the Earth to French people for twenty years and increasingly stated that these wonders are threatened by mankind. The Nicolas Hulot Foundation was created as early as 1990 to enable people to discover nature and protect the environment by exploration, education and communication. The “Défi pour la Terre” wasn’t the first communication campaign launched by the Foundation, but it has been the most fruitful as already more than 840,000 French people joined it and pledged to decrease their carbon dioxide emissions. Many celebrities also supported the “Defi“. Total actions by members would account for reduction of 420,000 tonnes of greenhouse gases emissions. During last year’s presidential elections, he asked the twelve candidates to sign a pact stating that once they would be elected, they would act on environmental issues and climate change mitigation. It was a major success as the elected President, Mr. Sarkozy, included elements of this pact into his own plans. Indeed, the “Grenelle de l’Environnement“, the central part of environmental actions in France, included several parts of Hulot‘s plan. Choose the train when going on holidays. As you can see, these actions cover the vast majority, if not the totality, of behaviors and lifestyles that can harm our environment. Edouard has an international blog. If you want to follow what is happening on the environmental scene in Europe, go visit him at Sustainable Development and Much More . . .
An international coalition of children exploring the high Arctic witnessed firsthand the latest dramatic development of climate change on Tuesday, July 22 as a huge chunk of ice was observed drifting off the Ward Hunt Island main ice shelf, forming two ice islands totaling 20 square kilometers. 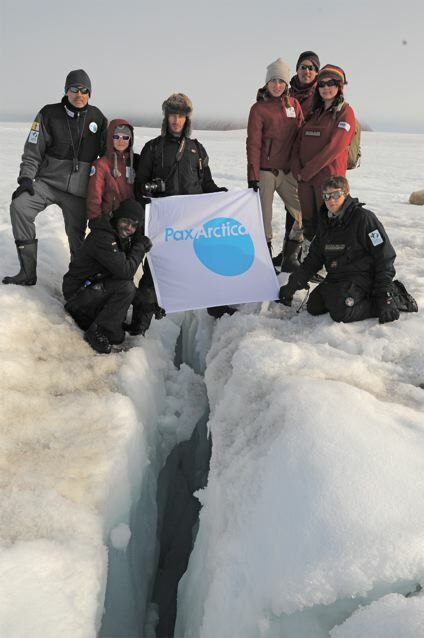 The children, assembled as The Young Ambassadors of the Arctic, are part of the Global Green USA and Green Cross Pax Arctica ’08 expedition. I have followed from a distance, all the media reports on the Arctic front. My friend’s mail brings that reality closer to me, somehow. Climate change is no longer some abstract, future notion. It is happening NOW, and I feel moved. Turning global warming into a personally relevant issue continues to be a challenge. 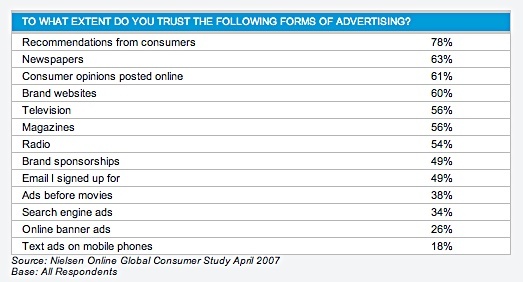 Something to consider for the “we” and “Together” campaigns . . .
Back from another one of my triumphant bike rides to downtown, this time to pick up pizzas at Il Fornaio, our favorite Italian. So glad I was. The three pizza boxes fit neatly into my side basket, not in the recommended horizontal position. The thought quickly brushed my mind, that maybe the toppings might slide, in protest. Oh, well, the risk was well worth taking. Off, I rushed back home. Again, sheer pleasure of being just me, with Pervenche, and the warm breeze. And plenty of times to savor the comings and goings inside my mind. Ah ah, just I was going over the bridge, it hit me. What had gotten me on my bike was not carbon calculators, not injunctions from Green Guru, not my green conscience, not the sinister prospect of global warming. No, what had moved me to pick up Pervenche, was the memory of how fun the last ride had been, and the knowledge that it would take me about as much time to bike, as to drive. Physical satisfaction plus convenience, all at no cost. The personal benefit was obvious. Forget the “we” campaign. What’s going to get people from ‘business as usual’, to leaving their cars in the garage, and not shopping as much, is the realization that such moves are not only good for the whole world but for them personally, also, in a very direct, immediate way. The recent gas crisis is another validation. These are the big four on my list. Can you think of others? PS – Do not transport pizza with the box on its edge in your side basket. The outcome ain’t pretty. Bare dough, with all the toppings squished against one side. We had a good laugh. I will be following with great interest the progress of the recently launched “Together” citizen engagement campaign on climate change. 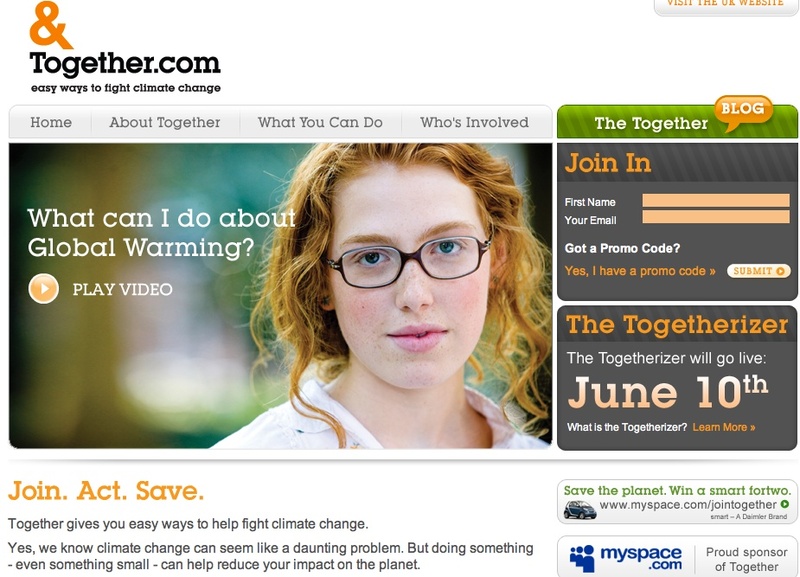 A UK import from The Climate Group, “Together” comes on the heels of Al Gore‘s disappointing “we” campaign. I like that it is a true collaborative effort between environmental organizations, major American cities, media organizations, and big businesses. Whether the citizens will respond is another story. Also, I couldn’t help but think, what would happen if the “we” people, and the “Together” team worked towards a single, unified campaign? Environmental organizations have this deplorable tendency of fragmenting their efforts. Don’t get me wrong, I love polar bears and I want them to survive for a very long time. However, on my list of climate actions, saving the polar bears comes after many, many other more important priorities, starting with limiting our greenhouse gas emissions and averting the world food and water crisis. Al Gore’s “we” campaign has made saving the polar bears its first initiative. 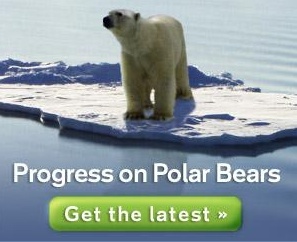 Every other day I get a mail informing me of ‘Progress on polar bears‘. Never mind all the research saying that you’ve got to make global warming personally relevant . . .
Al, when are you going to get this one right?